The German company PEAK-System has launched a compact USB adapter called PLIN-USB for connecting a computer to a LIN network. The adapter supports the LIN protocol according to ISO 17987 and complies to all LIN specifications up to version 2.2. The LIN interface can be used in master or slave mode. It has galvanic isolation up to 500 volts. The adapter is supplied via USB, and its LIN transceiver is powered externally via the 9-pin D-Sub connector. A pre-configured LIN connection cable is optionally available. 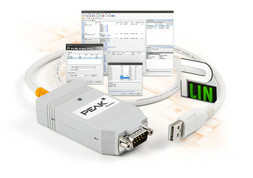 The PLIN-USB is delivered with Windows drivers, the monitor application PLIN-View Pro, and the PLIN programming interface for the development of applications with LIN connection. The LIN adapter is intended for service technicians for diagnosing LIN buses and for developers of vehicle networks, for example, to implement air conditioning, mirror, seat, and door control at low cost.